Honk! is a musical adaptation of the Hans Christian Andersen story The Ugly Duckling, incorporating a message of tolerance. The book and lyrics are by Anthony Drewe and music is by George Stiles (of the British songwriting duo Stiles and Drewe). The musical is set in the countryside and features Ugly ? a cygnet (who is mistaken as an ugly duckling upon falling into his mother’s nest) who is rejected by everyone but Ida (his mother), a sly tomcat who only befriends him out of hunger, and several other barnyard characters. He is brown and stubby and his brothers are nice white ducklings with yellow beaks. 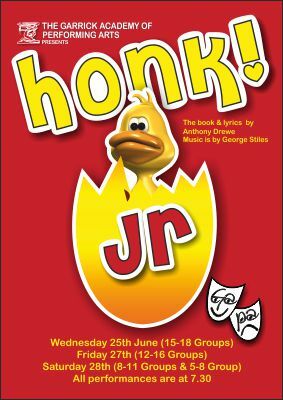 The junior version of Honk! that we are doing has been made for younger audiences but follows the same story. Honk! Jr. A slightly trimmed down version of the original British musical. We will be performing three versions of the show in June.